The committee publishes articles in The United States Specialist intending that it be the journal of record for U.S. essay and proof material at least of the 20th century. A variety of topics include unreported essays and proofs that have been offered for sale, the so-called “Roosevelt proofs, and the essays and proofs of the Overrun Countries series. The Chairman also provided the “essays and proofs” chapter for the Society’s Encyclopedia of United States Stamp Collecting. 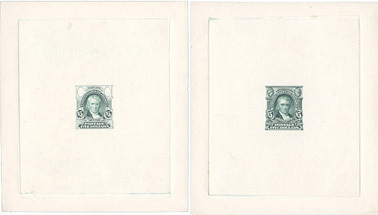 Other interesting Specialist articles have covered the issuance by The Philatelic Foundation of a certificate that “authenticated” a souvenir card cut-out as a “genuine die essay” of one of the stamps from the Famous Americans Series. This article also describes in detail the incredible amount of die and transfer roll work that went into the production of the souvenir card in question. Past Essay-Proof Committee members George Brett and Barbara Mueller, who (along with Tom Alexander) been named as recipients of the 2004 Smithsonian Philatelic Achievement Awards. This is a well-deserved tribute for these two exemplary scholars. The Smithsonian’s “design source” list as a scanned file which was reproduced in the December, 2002. It can be found in The Specialist Digital Archives. Barbara Mueller and Chairman, James Patterson both participated in the editing of the Society’s Glossary of Terms for the Collector of United States Stamps, and Patterson’s June 1998 article “Small die Proofs of the 20th Century’s Second Quarter” is available in the Society’s Reprint series.